I have been wanting to do a really nice piece of furniture for my store for a while now as I really enjoy making these items. 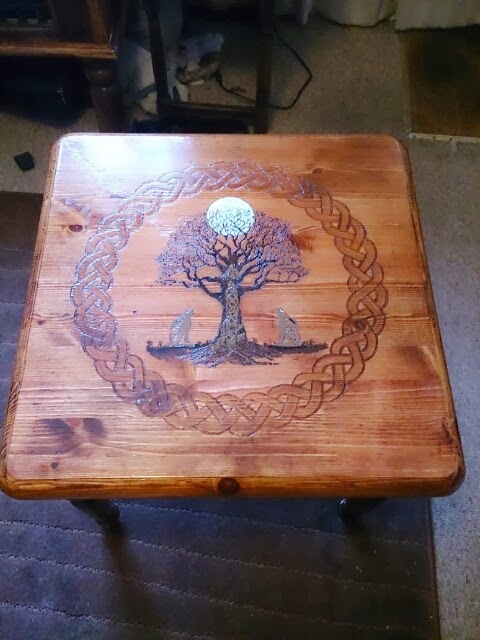 A nice coffee table was chosen and the design, well, Moon Gazing Hares are my favorite so that was easy to choose. 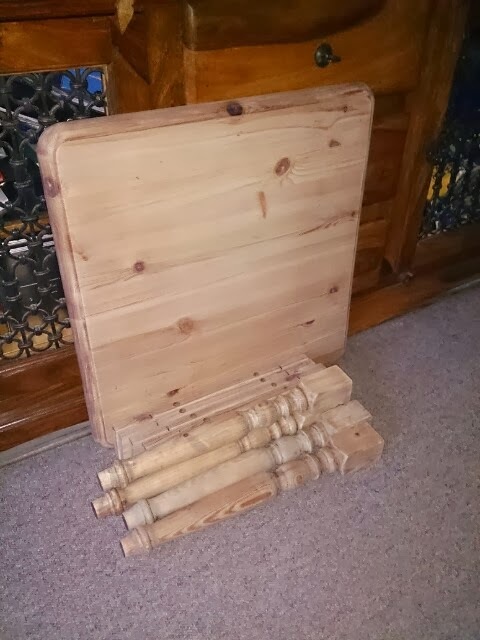 When I start any new item, I always remove any old staining or varnishing that has been applied to the item so that I am able to start with a blank canvas, so to say. As the pictures above show, the table was originally that horrible orange/stained color, why they insist on trying to make tables this color is beyond me. After about 3 hours, this finish had been removed by hand and sandpaper back to bare wood. 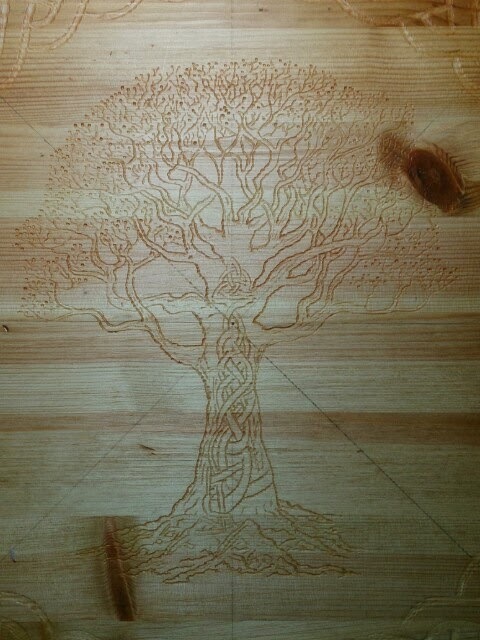 Now that the table was bare wood, time to carve the selected design. 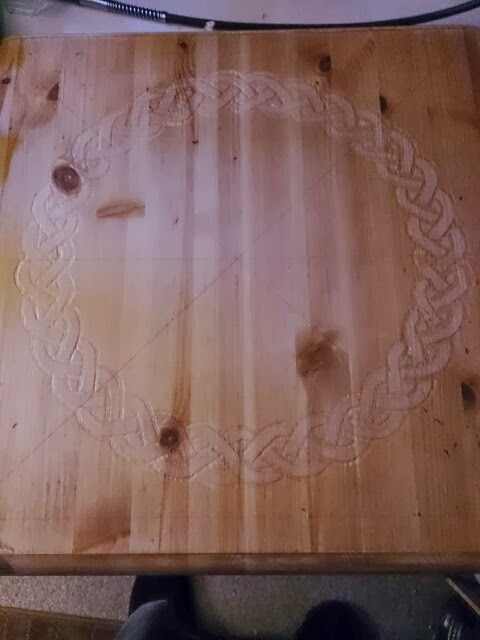 First of all I had to get the Celtic Knotwork circle correct and central so it looked exact. 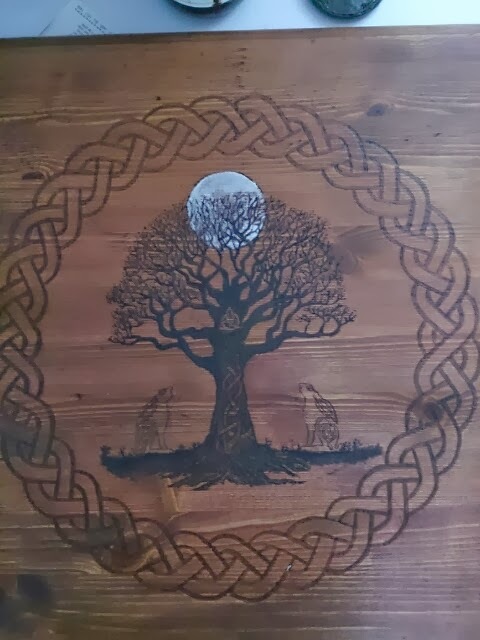 Now that is done, tree is next, the trickiest part as it incorporates Celtic knot work running up the truck and down into the root structure and it took me several hours to get it looking right. 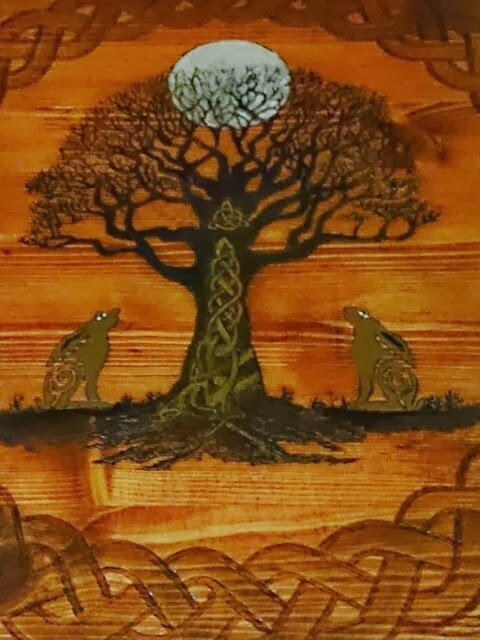 Once I was happy with the tree and the Celtic Circle, the hares were added and then the first layer of woodstain. 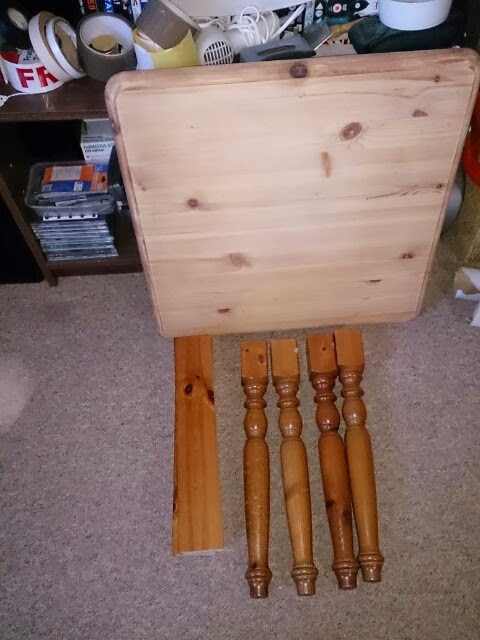 Once the stain had been applied, it was lightly sanded using fine wire wool and then a 2nd coat applied. This was also lightly sanded and then a different color applied to bring the design out. 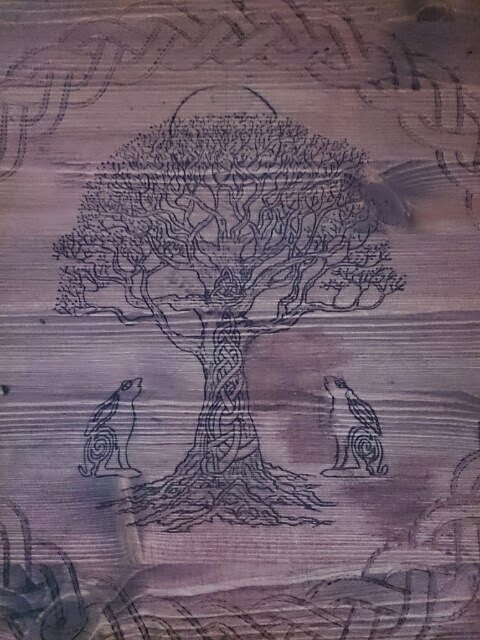 Once I was happy with the color after applying a few more layers of stain of a different color again, the picture above gave me a great outline ready for me to hand paint the design. I used water color paste and acrylics along with various wood stains to complete the picture. 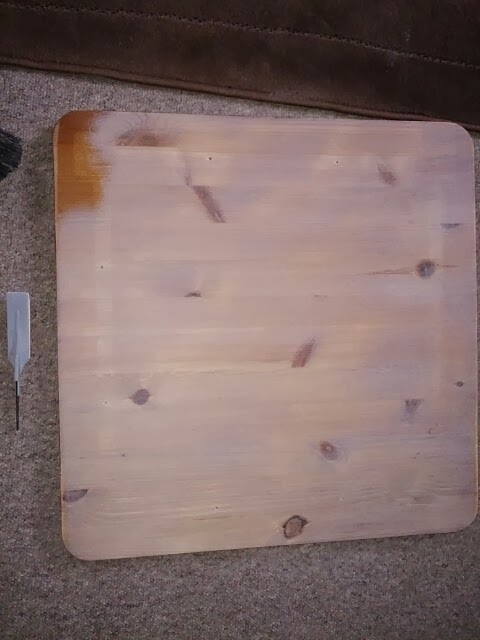 The hares where then painted in and the table was then ready to seal to prevent the design being removed or damaged when wiping it with a cloth and polish. To seal the water color was tricky. As it is water based, I had to dab lightly a layer of PVA glue onto the top of the design. Once this had dried, I knew the image would be safe to varnish. 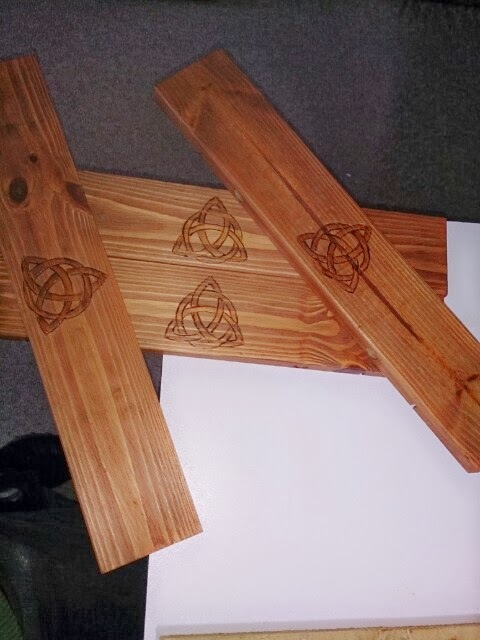 The side panels were then carved with a triquetra symbol to tie in with the one in the trunk of the tree and stained to match the color of the table top. Now all of the parts were ready for varnishing. The finished item after applying 3 layers of heavy duty yacht varnish for added protection looks truly stunning and would really great in any room. The item is in my store for purchase and there is a small video of the above stage on my facebook page. Another new item is already in production and I will post again once it is finished and I can run you through that project. Keep tuned in for my latest items on my facebook page and check out my gallery on my main website.